1/2” Polyethylene foam sheet 47”x108” from foam factory. A key is that you can not glue this foam. More research... it can be heat welded. You basically use a heat gun and start to melt it and stick the pieces together. The foam isn’t cheap. I could heat weld layers together to make a solid cube, which I then would cut out the slots to hold the pistols. The problem was that approach created a lot of waste. I figured I would use sheets as dividers. While cutting 1 1/4” pieces that I weld together and make blocks to go between the dividers. This should make sense with the pictures. This would cut my material usage in half. The sheet of foam I ordered could have made the whole cube... I just wasn’t sure how this would all work out so I was cautious. Last night I finally got the foam and started. The longest part was cutting the piece that goes on the bottom. There are lots of edges and bevels to cut out. From there I started “welding” in the dividers and smaller pieces. WARNING: It is UGLY!!!! I’ve never done this before and I wasn’t a pro. If I could do it again I would probably make the cube and cut slots.... BUT it is solid and completely functional! Ultimately I am in it for probably $65 had I ordered less foam. I didn’t even use half the sheet I purchased. This is a huge deal, albeit ugly. Whew, that is sweet! That is something I would of loved to get... just couldn’t fork up the $$$. How do you like it? Another alternative, if you have some ammo cans available of course. 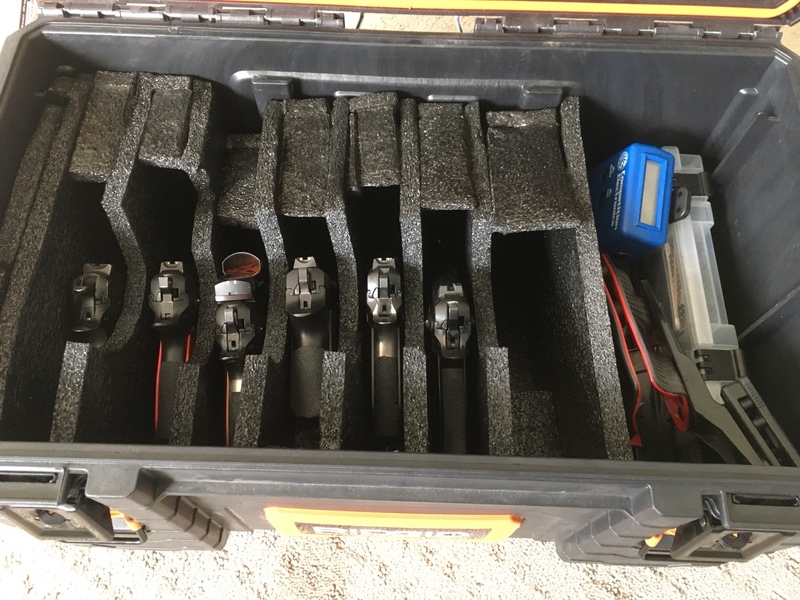 I have the Case Club inserts to hold magazines. Each 50 cal can, can hold 24 mags. They work well but the spacing is very tight w/ double stack mags. If I didn’t have a foam insert for a Pelican 1510, four pistols, I’d consider the Case Club 50 cal can foam. I spent slightly more than what the OP has spent and the foam just dropped in. Kind of glad I didn’t go the DIY route. The Pelican is great. 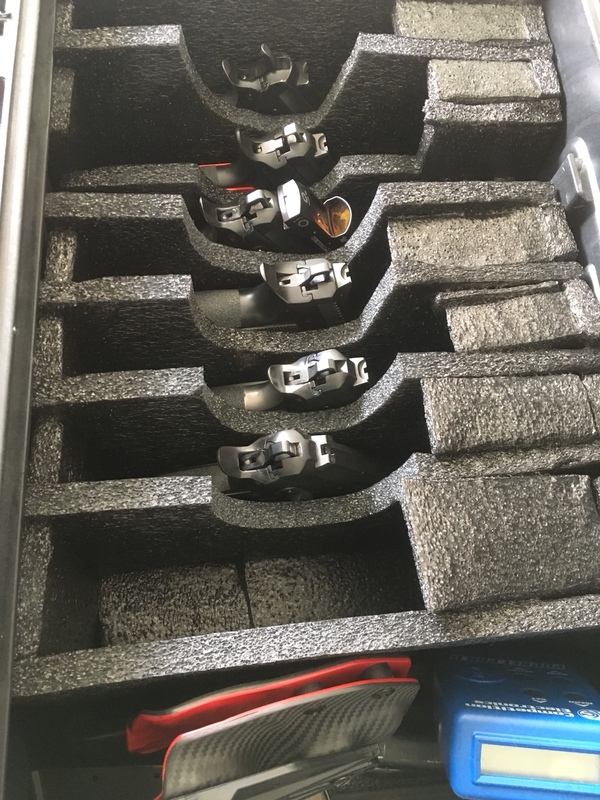 I am typically bringing 10 or 11 pistols (+ a Scorpion) to demos, so it is great to have them organized in 1 box. The M9 sized cutouts work fine for pistols the size of a TacSport or smaller. If there’s nothing made for what you have, DIY is the only option. I never priced out the foam to do it myself but it appears the precut pieces aren’t much more than the raw material. At least on a small scale. 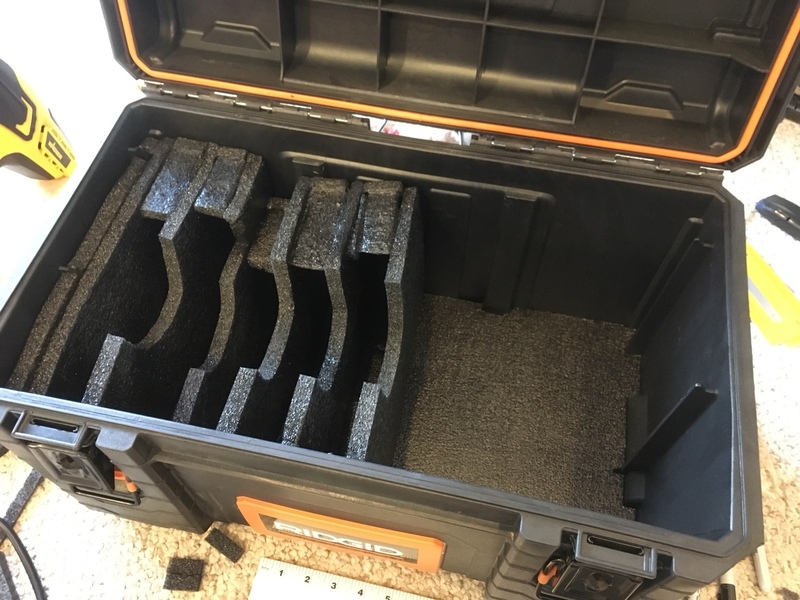 For anyone that has a Pelican case look up CVPKG as they make all types of inserts and accessories for the cases. 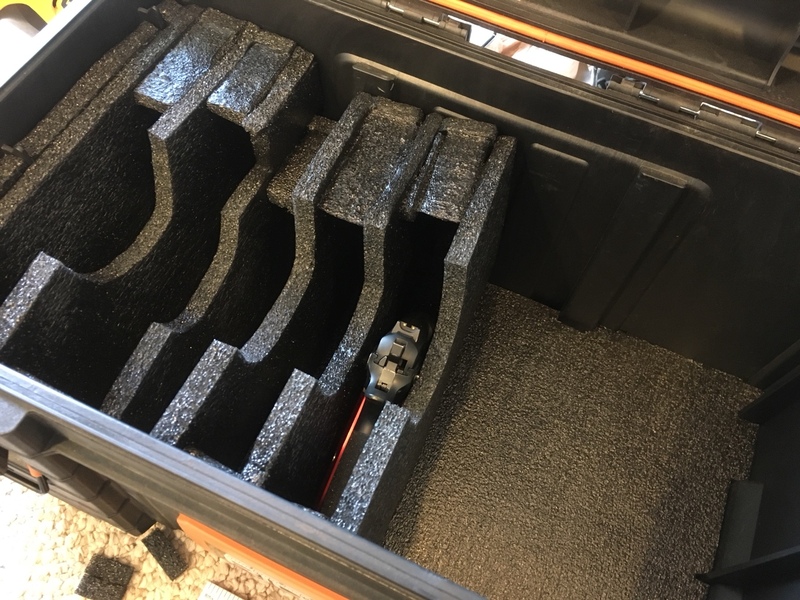 Don’t think the company I work for would be to thrilled if they found out I was using a company supplied pelican case to transport pistols when I’m able to take them where I’m working. It will be coming w/ me this week to Phoenix. Neat, looks pretty darn good to me. Thank you for the post and the pics. All CZs too, that is the real important part. 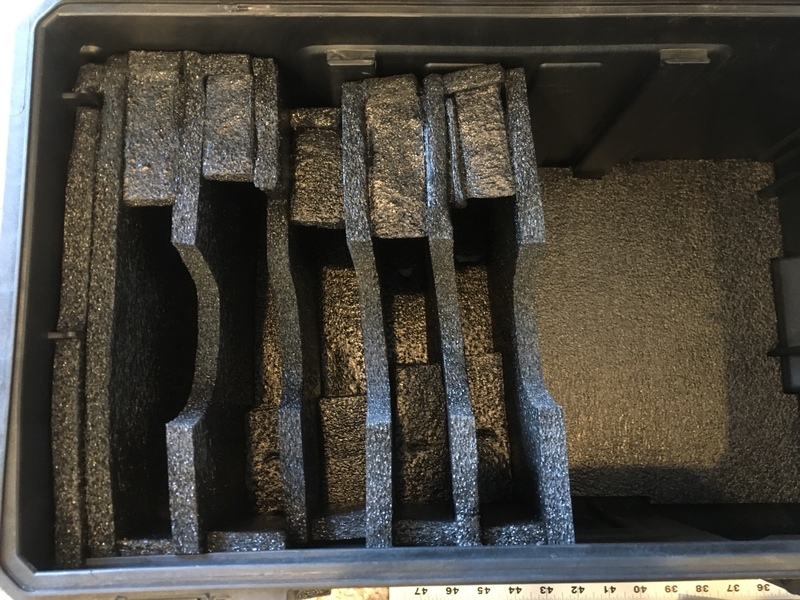 The polyethylene foam is definitely more that the pick and pluck options. 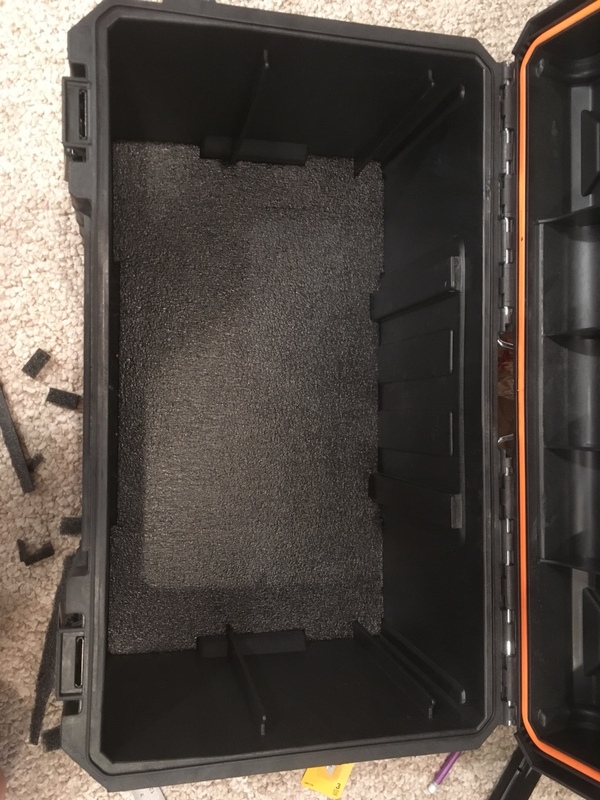 It doesn’t hold moisture or chemicals, so it is a little more friendly to firearms storage. It’s also more rigid so I could use thinner dividers. From reading it seems like this his due to its closed cell nature. If I’d found pick and pluck in polyethylene foam I would have gone that route for sure. Yeah... I have problems. I had a Tanfoglionfor a while but became monogamous again. I made an extra slot to see what my future holds. Well done! It doesn't look bad at all. 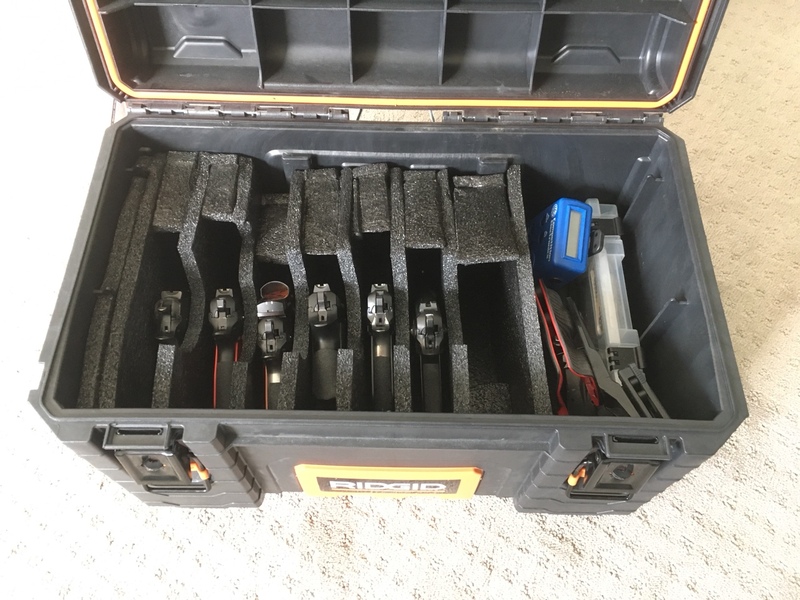 A good alternative to Pelican Cases: Harbor Freight now carries a line of very good quality knock-offs at a great price. ScarlettPistol that is an impressive DIY job!!! I like it nicely played!!! Could you use something like a wood burning tool, or soldering iron, with the right shaped tip on it to melt the edges together? Sort of like welding. Push the surfaces together, when the tip/blade is at the right temperature drag it along the seam (probably have to do it on both sides if the tool would fit in there) to melt the two pieces together and then build on it to make it larger. My youngest son got me a back pack rig a couple years ago. It has a compartment of similar foam with slots for up to four pistols (unless one of them is a Tactical Sport. Those won't quite fit. The other CZ's fit fine. Lots of pockets/pouches for ammo, tools, safety gear, targets, etc. I think I've had it to the range twice??? I just don't think about loading it up till I get home and see it sitting in the garage as I pull stuff out to start the cleaning process (on pretty days). And, first time or two your getting the feel of things. You keep doing it and you get better at it. Use what you learned this time to make the changes you wish you'd have done this time. Then sell your first one if you don't need two of them. Thanks, and thanks for sharing! That’s an interesting idea. My wood burning tool just turns on and it get super hot, hot enough that it would just burn the foam. If it had a control I imagine your idea could work. I’ll definitly try it again and hopefully I improve.